WASHINGTON — The nation’s largest union, the 3-million-member National Education Association, has demanded GOP President Donald Trump’s Education Secretary, Republican big donor Elizabeth “Betsy” DeVos, quit. She was “utterly unqualified and unprepared” then and represented a bad agenda for public school students and teachers, union President Lily Eskelsen-Garcia, an elementary school teacher from Salt Lake City, said. And DeVos hasn’t improved in the ensuing year. “DeVos isn’t an educator, or an education leader. In fact, she has no relevant credentials or experience. 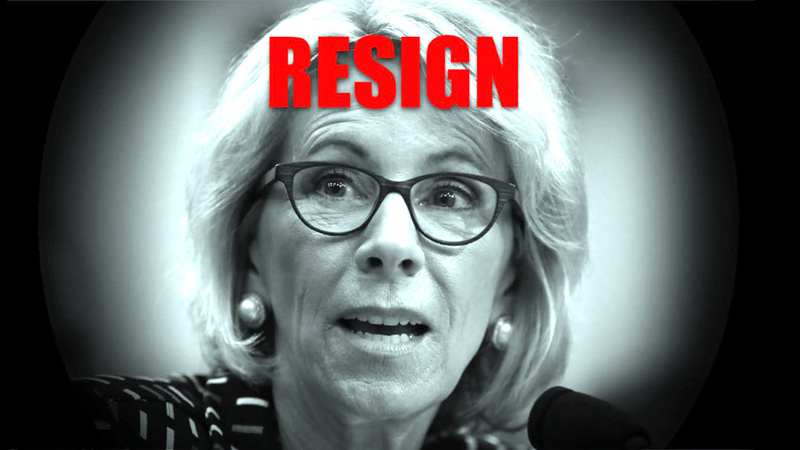 She has had zero experience in public schools, except trying to undermine and obliterate the very system that opens its doors to all, not just a few, students. “We knew she failed Michigan’s students,” by pushing a voucher system there. “Now she’s failing students across the country. “Every decision she has made since being confirmed is proof she still does not have the best interest of students at heart, that she does not understand the mission and importance of public schools or the importance of students’ civil rights in schools and on campuses. As the nation’s top advocate for students, that is incredibly troubling. DeVos married into the rich, right-wing Michigan family who owned the Amway Corp., a scheme that took advantage of low-income people seeking to “get rich quick.” An ex-Michigan GOP chair, DeVos used her Amway money in campaigns to trash public schools and teachers. Her confirmation overcame opposition from NEA and the American Federation of Teachers, civil rights groups, citizens’ groups and disability rights groups, among others. They criticized – and still do – her lack of knowledge and commitment to the public schools, which teach 90 percent of U.S. children, her hatred of unions and teachers and her campaign for taxpayer-paid vouchers for parents of private school kids. Since then, the unions added DeVos’ rollback of civil rights protections and denial of student loan forgiveness to for-profit college students whose institutions first cheated them, then went broke or closed, to the secretary’s report card. 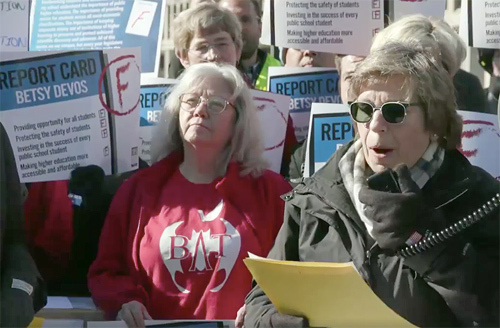 All that led both Eskelsen-Garcia and AFT President Randi Weingarten to show up at the department’s doors on Feb. 8, boxes with thousands of petitions in hand, and teachers and TV cameras in tow, to demand DeVos meet with parents, teachers and students. DeVos’ guards locked them out. “Students, educators, parents, civil rights and special education advocates — along with millions of Americans — have been speaking out, loud and clear: We are here to stay and we will protect our students and public education,” Eskelsen-Garcia said. NEA also started on on-line petition demanding DeVos resign, while AFT is soliciting “grades” of DeVos.